JOHNS: Everyone brings passion to [the project]. I bring passion to the story that I'm telling and the characters that I'm working on. George brings passion to the Legion because this is the one book he's wanted to draw for forever. It's just a real honor to be able to work with someone like George on these characters at this time. PÉREZ: It was just one of those things where everything aligned perfectly. [DC] mentioned the fact that they were doing a story which would incorporate [the original Legion] in addition to the current version and what I call "the Intermediate Legion" by Abnett and Lanning. That was the first time I actually heard the concept of using all the versions of the Legion, and I said, "Well, doesn't that seem to have my fingerprints all over it without me even touching the page?" PÉREZ: Geoff usually writes full scripts. This time he's working [plot style]. I draw the artwork, I make notes and then he scripts it from there. It allows me to contribute to a story. I'm a little hamstrung if I'm forced to follow every single panel and every angle that's described on paper. Geoff has been, thankfully, very happy about the little twists and turns I take with the plot and little character bits I add in. JOHNS: My plots on this are so long and so detailed that it's actually more work than that of a full script. [Laughs] The important thing is not who is punching who. It's what that character is going through and how the characters are interacting. I need to have those beats and those scenes described intricately so George can pick up on all those. I really like it because he knows exactly what he's doing. So, when he comes up with an idea to choreograph something a little differently or make a change, it's been wonderful. PÉREZ: I have so many. I love trying to get my hands on the female characters. I'm looking forward to doing [Dawnstar], and I like to be able to do a flashback somewhere where she's wearing her old classic costume. I'm hoping that somewhere along the line I will have drawn every member of the Legion in as many of their costumes as they appeared in. JOHNS: I basically pulled at my favorite characters I remember liking [when I was a kid] and they're the central characters of the piece. The three founders—Cosmic Boy, Lightning Lad and Saturn Girl—Dawnstar, Wildfire, Brainiac 5, Polar Boy, Sun Boy…those are my main characters. JOHNS: I'd love to do it. It's just a matter of the right person to do it with and the time. But I'd absolutely love to write a monthly Legion of Super-Heroes book. 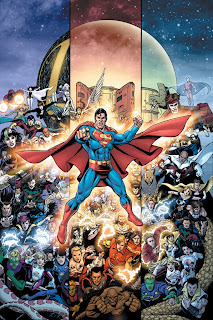 I really want to write a Superman the Legion of Super-Heroes book. I don't know if it'll be a reality or not, but it's definitely something I want to do.